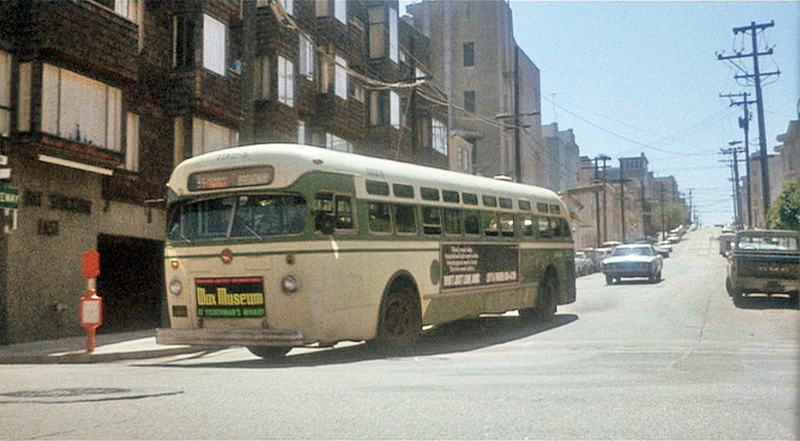 The 55 Broadway bus, carrying Jake and Camerero, passes Washington Square Park on the left and Saints Peter and Paul Church on the right (map), about to make a left from Filbert Street into Stockton Street (in real life there was no such bus line). Throughout the chase, click or tap the image or thumbnail to compare Then with Now. 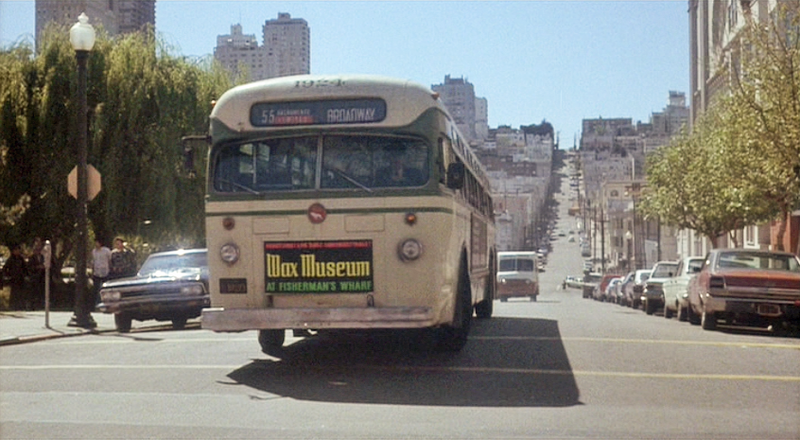 From Stockton the bus makes a right into Bay Street (map) with Larsen following in pursuit. They continue along Bay towards Pier 33 on the Embarcadero. 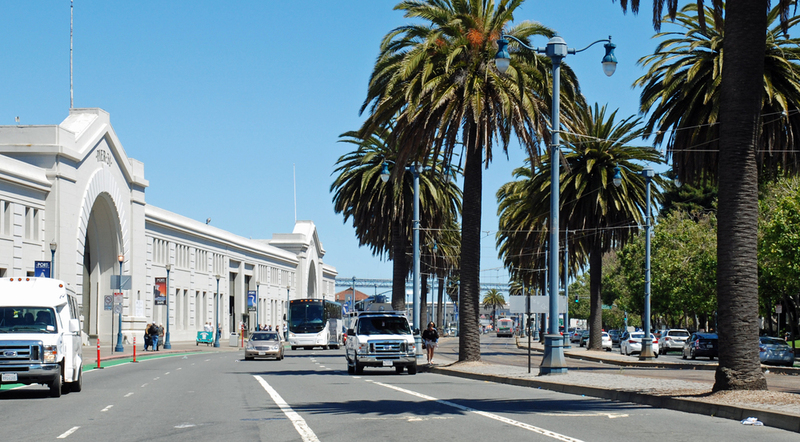 This bus sure goes a long way between stops - here it has turned south down the Embarcadero heading towards Piers 31 and 29 and that's the Bay Bridge in the distance. 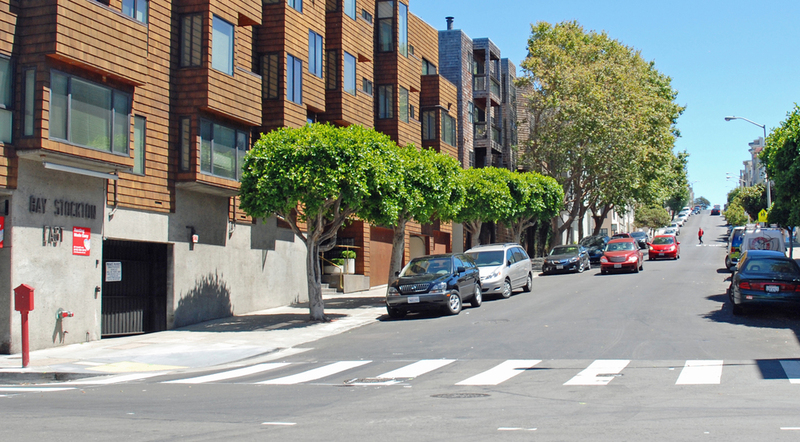 Today's Embarcadero is wider, with tram tracks and palm trees down the center. Larsen stays as close to the bus as he can. 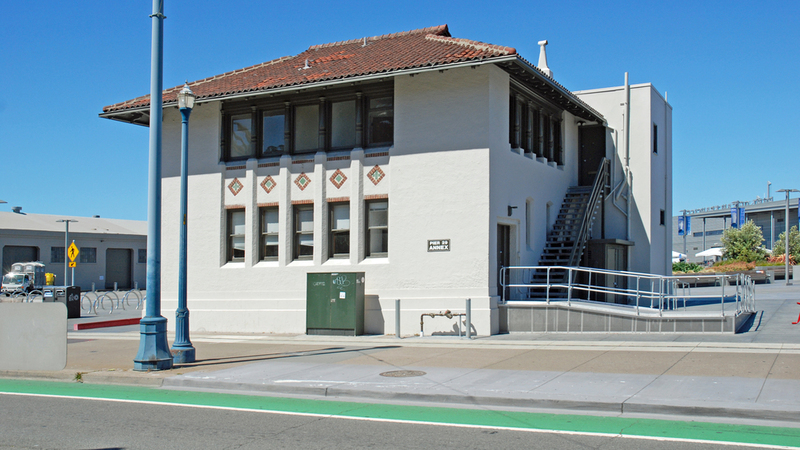 He's passing the Pier 29 annex, originally the administrative offices for the State Belt Railroad that used to haul goods along the length of the Embarcadero. While adjacent piers 25 and 27 have long since been demolished, that building remains as a lone survivor, now with an ADA-mandated ramp for the handicapped. 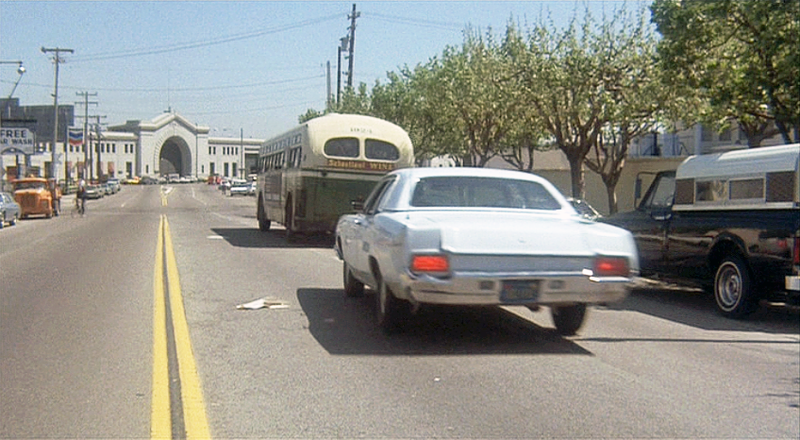 In his haste Larsen swerves, narrowly avoiding another car, before getting back on track. 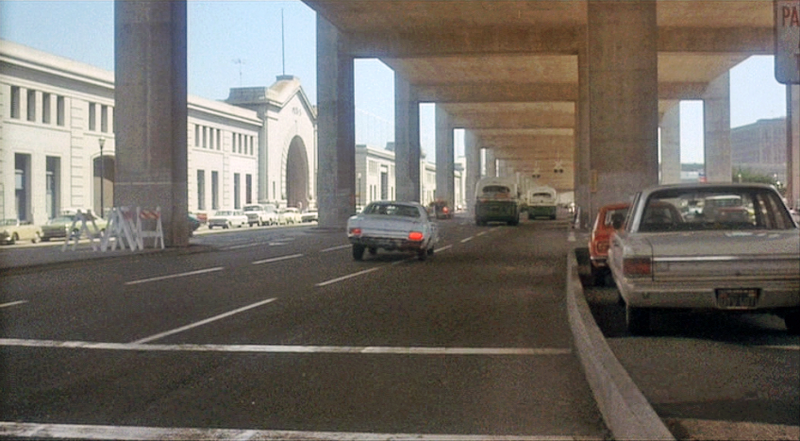 This view looks north along the Embarcadero past Pier 9 on the right. 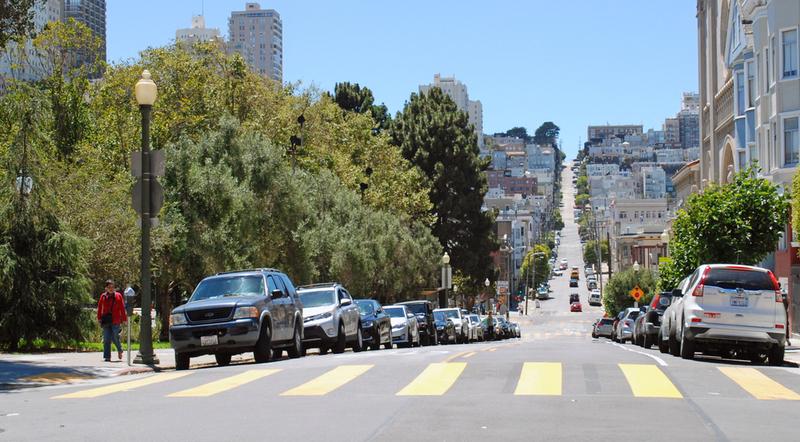 The north end of the Embarcadero Freeway swings left to the Broadway ramps but now the freeway is gone leaving a clear view of Coit Tower atop Telegraph Hill. 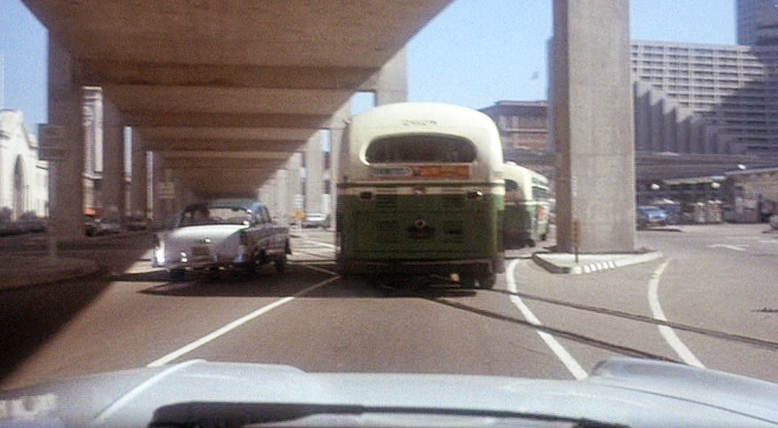 As they approach Pier 5 this shot shows why the Embarcadero Freeway was such a bad idea. The ugly structure isolated the waterfront piers and the Ferry Building a little further on from the rest of the city. 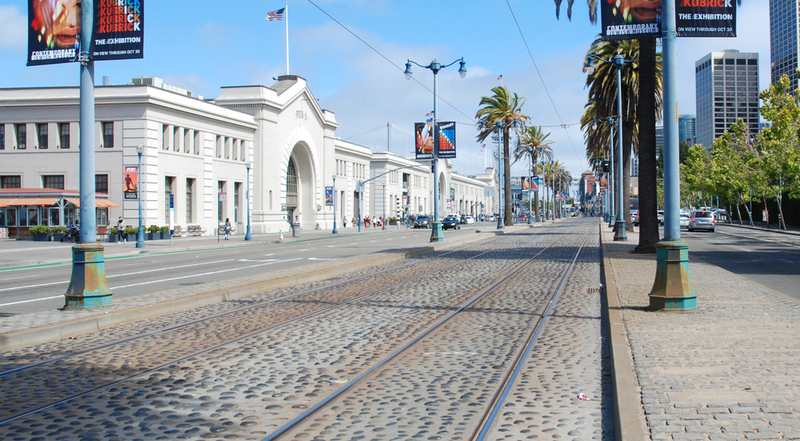 Damage from the 1989 earthquake eventually led to the freeway's demise - the recent photo shows how opening up the area and adding tracks for the historic streetcar E and F lines has transformed the waterfront. It also shows that the Pier 5 bulkhead was modified after the adjacent Pier 7 (just out of view at far left in the Then photo) was removed. 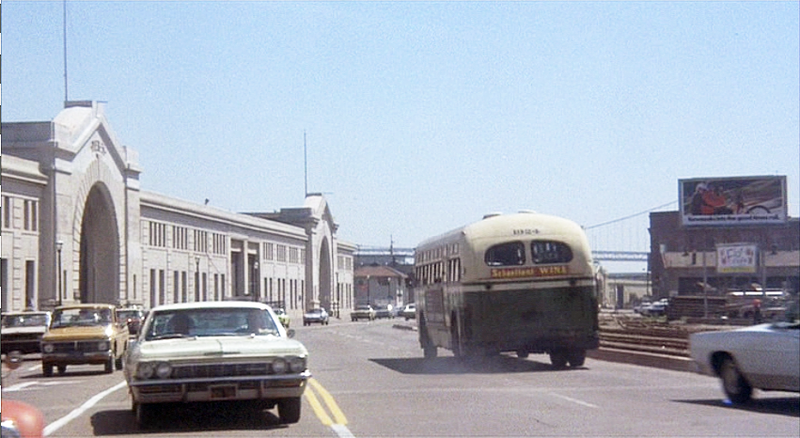 Another bus gets in the way as they approach the Ferry Building on the left and the stylishly ramped Hyatt Regency hotel on the right. The hotel today is surrounded by newer Financial District high-rise office buildings. Looking back to the north towards the oncoming bus the end of the freeway at Broadway curves off in the distance. In the foreground Washington Street tees off to the left and there's a Chevron gas station further down, no longer there. On the bus, Camerero has had enough. Just as he did at the start of the movie he opens his briefcase and furtively assembles his weapon. This can only end badly, will this be another bus massacre? The showdown must come.